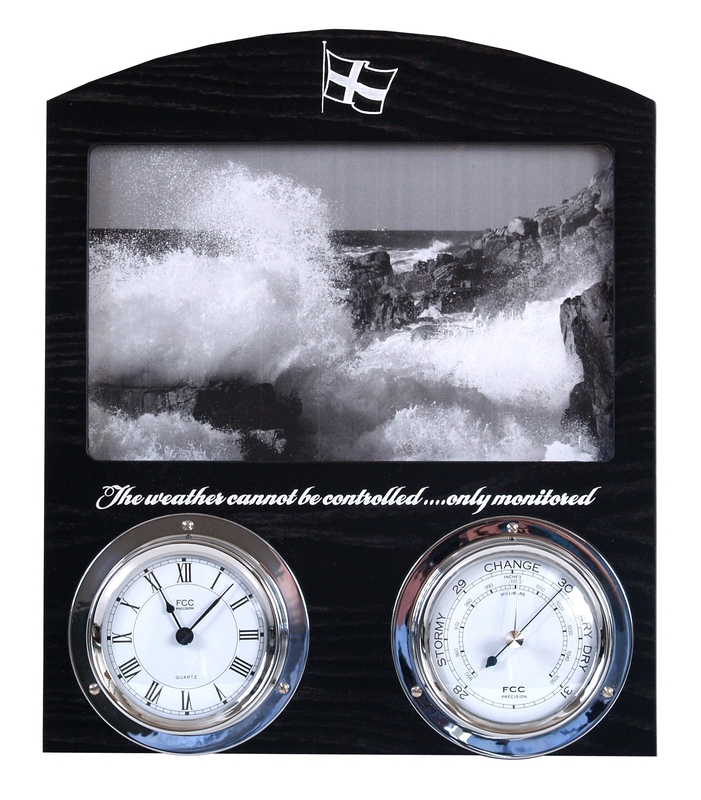 Cornish Indoor weather station with photo frame. Cornish Flag engraved at top. A contemporary weather centre which includes a photo frame. A charming way to personalise your gift. A long lasting momento. Choose any 2 spun chrome instruments. Clock, Barometer, Hygrometer/Thermometer or Tide Clock and we will mount them for you. Allows you to really personalise your gift by choosing the most appropriate instruments plus include a photograph. Makes a wonderful present for anyone with wonderful memories or connections with Cornwall. 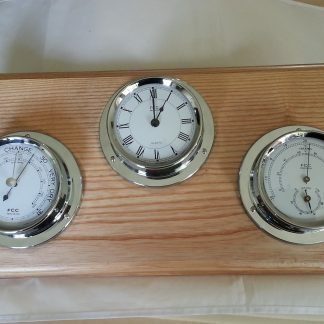 Cornish Indoor weather station with photo frame chrome. A contemporary weather centre which includes a photo frame. A charming way to personalise your gift. A long lasting momento. Choose any 2 spun chrome instruments. 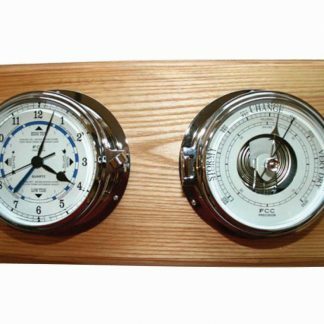 Clock, Barometer, Hygrometer/Thermometer or Tide Clock and we will mount them for you. Allows you to really personalise your gift by choosing the most appropriate instruments plus include a photograph. Clock quartz driven. 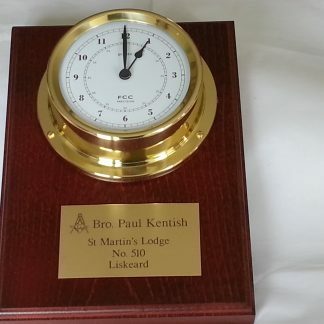 All our clocks are supplied with batteries and will work as soon a battery is installed. We recommend you use quality batteries and that they are changed once a year to avoid leakage. We do not recommend the use of rechargeable batteries. 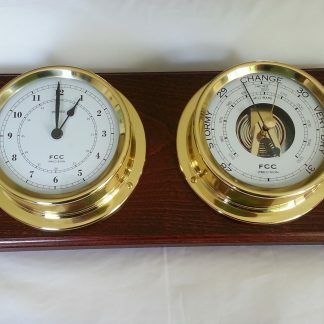 Barometer reads the atmospheric pressure for the immediate area. 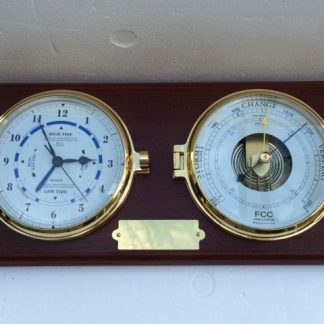 The barometer forecasts weather conditions 12 – 24 hours ahead. A very useful tool for anyone involved in outdoor activities: farmers, walkers, gardeners, equestrian. Full instructions and information on how to forecast your weather conditions in your local vicinity provided. 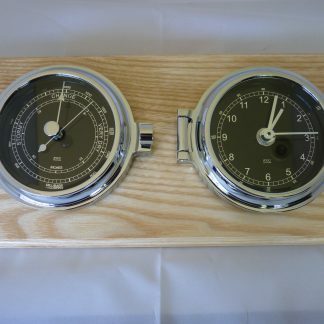 Hygrometer/Thermometer these instruments measure the climate in your home. Thermometers measure the temperature and Hygrometers measure the humidity in the air. A comfortable room has a temperature range of 18-22C with a humidity reading of between 45 and 70%. 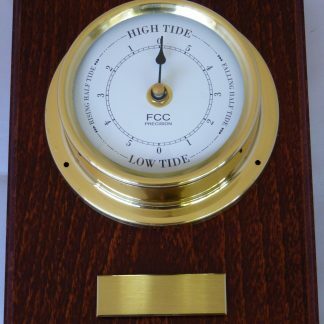 Tide Clock will predict the average state of the tide for an area of your choice. Perfect addition for any household living near tidal water. Full instructions will be provided to set and use your clock. Quartz driven. Battery supplied.